Ideal For A Good Bike Fit. ProsNot Expensive, easy to fit, usual good delivery service from SJSC. As we get older it makes sense to change our riding positions......unless SJSC also do Stay Young Pills ! However, this item allowed me to get a comfortable riding position on a bike which was always nearly, but not quite perfect. ConsMatt black would be nice. Very well engineered product, simple to fit, very secure. This has cured a long running niggle with my Specialized Globe Pro hybrid, I can now take on 70 mile plus rides without discomfort. I needed the lift for the bars and it did the job. Easy to find and great price. Would by again from this vendor. Ideal piece of kit. Easy to fit and gave the extra lift I required. Delivered within 2 days of order being placed great service. 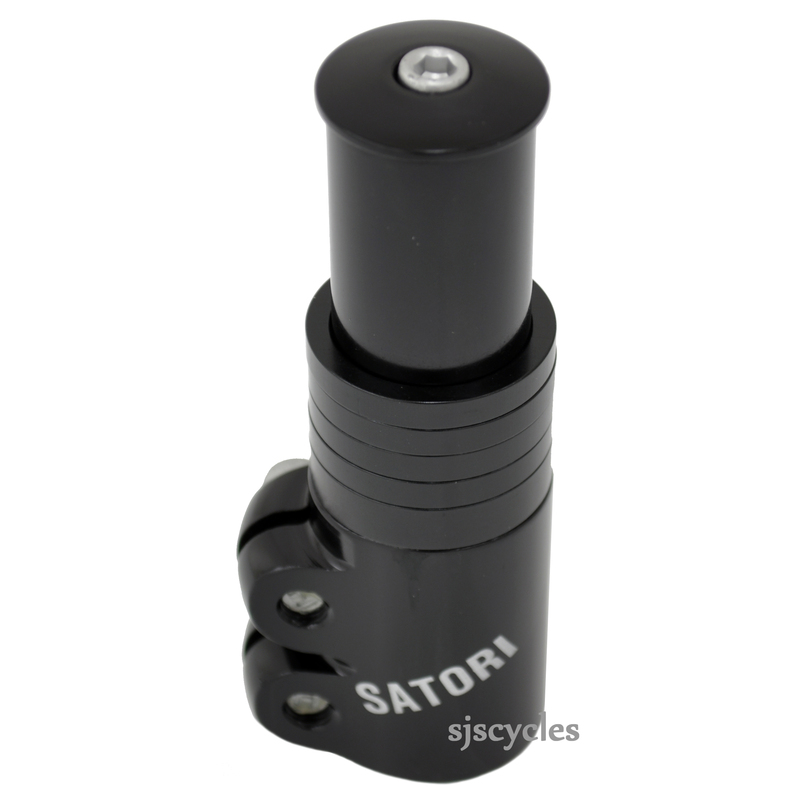 This Satori adapter is a simple construction and makes the impression that it is strong. I would trust it on a mountainbike made for rough stuff. In my case it's mounted on a touring/commuter bicycle. Installation is simple as spacers are already included, along with top cap and top screw as well. No extras needed! Total height of the product is 120 mm. Needs a minimum of 35 mm fork tube to clamp on to. I have the black version and the finish on this one is a bit glossy. I bought one of these a few weeks ago but I can't get my headset tight enough with it. With the stem off, I have 55.5mm of steerer tube above the headset. Is this enough or too much? The adapter doesn't go right down to the headset. I've tried various combinations of spacers above and below. You need 40mm of excess steerer tube showing for this to pull up tight. Does this mean I have to cut my steerer tube to fit a steerer tube extension? Seems a bit daft. You will just need to add more spacers before fitting the extension. What length is it - and do you sell them? The bolt supplied with these is 110mm in length and ha an M6 thread. We don't have them as a spare part I'm afraid. Will These Items Fit Carrera Crossfire And Gt Transeo 2 Hybrid Bikes? Recently upgraded from our heavier old MTBs to much lighter Hybrids. Are these stem raiser extensions a good way to help achieve a more comfortable riding position? Providing both of these bikes have a standard 1 1/8" ahead style fork and stem then these stem raisers will fit and work fine. If you're looking to significantly raise the height of your stem beyond what is possible when fitted to the forks current steerer tube, then a stem raiser is the only option. Can You Mount This On A Carbon Fork? If your fork is fully carbon so has a carbon steerer tube then we would not recommend fitting this, if it has an alloy steerer tube bonded to the carbon fork legs then it should be okay. Would This Item Fit Nomad Mk2 Fork? When bought my nomad I unfortunately asked to have the steerer cut a bit too much. Later on, got back injury at work and since that day I need more upright position when riding (I initially asked for fairly sportive position, if memory serves well). Going for a multi month tour in july and hope this would solve my comfort issues... Cheers, David. This item will indeed be compatible with your Nomad.